Platinum-rich cosmic dust incursion triggers the onset of the Younger Dryas. New evidence has come out that definitively supports the solar theory of the Pleistocene megafaunal extinction and puts to rest the idea of a comet impact. Before addressing that, let’s review the various extraterrestrial cause theories that are out there that attempt to explain this. One theory, first proposed by myself in 1983 (PhD dissertation) suggests that the Sun as the cause, where the solar activity was aggravated by the incursion into the solar system of cosmic dust. Another theory proposed in 2001 by Firestone and Topping suggested that the extinction was due to a nearby supernova. Topping, who earlier had been studying cosmic ray tracks in mammoth tusks and had believed that a solar outburst was the cause, later converted to Firestone’s supernova theory, only to eventually abandon it a decade later to return to the solar theory. Firestone teamed up with West and Warwick-Smith in 2006 to write a book proclaiming that a comet impact had caused the megafaunal demise, and in 2007 they announced their theory along with 25 others in the Proceedings of the National Academy of Sciences. Although their theory was considered controversial by most of the geological community, they became the darling of the media and had no trouble making the world aware of their theory. In that paper, they make no mention of Firestone’s supernova idea. Only in his book does he claim that comets having diameters in the range of 100 to 500 kilometers were supposedly injected into the solar system by a supernova. I wrote a critique of their paper in 2007 which lists 22 problems with their supernova/comet impact theory which were evident at the time they proposed their theory. GC outburst — superwave — cosmic dust incursion — solar activation — extreme solar flare — extinction. Firestone’s theory also involved a sequence of events: supernova — injection of large comets — extinction. He had to claim a supernova event by necessity since otherwise there would have been an extremely small chance of the Earth encountering such large comets. Similarly, in my own theory, the chance that the Sun would undergo an extreme solar event or even a nova is extremely small without some trigger such as a superwave induced cosmic dust incursions. A nearby supernova (if it were to occur) would also have aggravated the Sun due to the incursion of cosmic dust and debris; but Firestone did not choose that approach. In 2011 I published a paper in the journal Radiocarbon which pointed out the exact depth in the GISP2 ice core where the proposed mega solar proton event (SPE) had occurred. The event dated to 12,837 years BP in the Cariaco chronology and lasted 4 months. It occurred in conjunction with the largest nitrate spike and the second largest acidity spike to have occurred during the Younger Dryas, and was accompanied by a 4 cm thick dark layer in the ice. It was flanked on either side by high levels of biomass indicators, evidence of wildfires triggered by the solar event, and was also followed by a 7 year long climatic warming. The article has done fairly well. It has had over a dozen citations until now, including mention in master and doctor dissertations. Also it is discussed in blogs and even Wikipedia wrote about the finding. The evidence presented in this paper overwhelmingly supports the occurrence of a deadly solar event about 70 years after the beginning of the Younger Dryas. While both theories speak of extraterrestrial material being deposited on the Earth, there is a big difference between them which is testable. Namely, with the comet impact theory one would expect a single spike or multiple spikes of extraterrestrial debris produced by the impact of one or more comets, whereas the solar theory predicts that cosmic dust that entered the solar system as a result of a superwave passage would result in material being gradually deposited on the Earth’s surface. The recent finding of a platinum peak at the onset of the Younger Dryas reported by a group of Harvard scientists, Petaev, Huang, Jacobsen, and Zindler, may settle this matter once and for all. The researchers had analyzed 88 GISP2 Greenland ice core samples spanning the YD boundary for various elements. 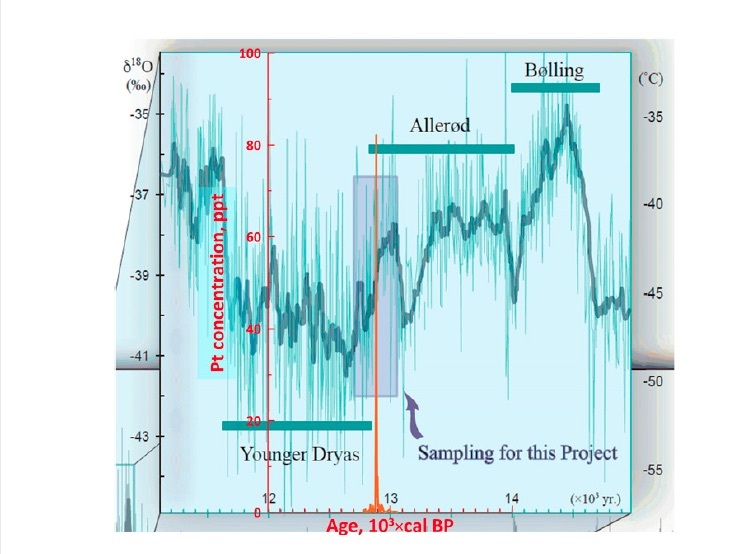 In samples precisely at the YD boundary, immediately prior to the progressive 200 year cooling, they found a 100 fold increase in platinum concentration which rose and fell over a 21 year period. They ruled out a comet impact since dust from an impact event would have been airborne only for a few years. Also multiple impacts were ruled out since the Pt peak ramps up and down without any abrupt spikes. Their finding that extraterrestrial material was deposition gradually, favors the solar cause explanation. The figure at the top of this posting shows their results. The event dates to 12,957 BP, based on the Cariaco chronology adjustment to the GISP2 chronology, which gives a date 70 years later than theirs. Other evidence against the comet impact theory comes from a study done by van Hoesel, et al. (2012). They looked for nanodiamonds in the carbon-rich black layer called the Usello Horizon, near Usello, Holland. The diamonds they found were the type formed by wildfires and not those formed by impacts. Their findings disproved a key claim of the impact theory which claimed that this layer was produced by a comet impact. Based on this they concluded that this Pt was likely from cosmic dust of unusual composition that had been injected into the solar system. This is supported by my findings that superconducting tin-rich interstellar dust of anomalous composition had entered the solar system on several occasions during the last ice age. 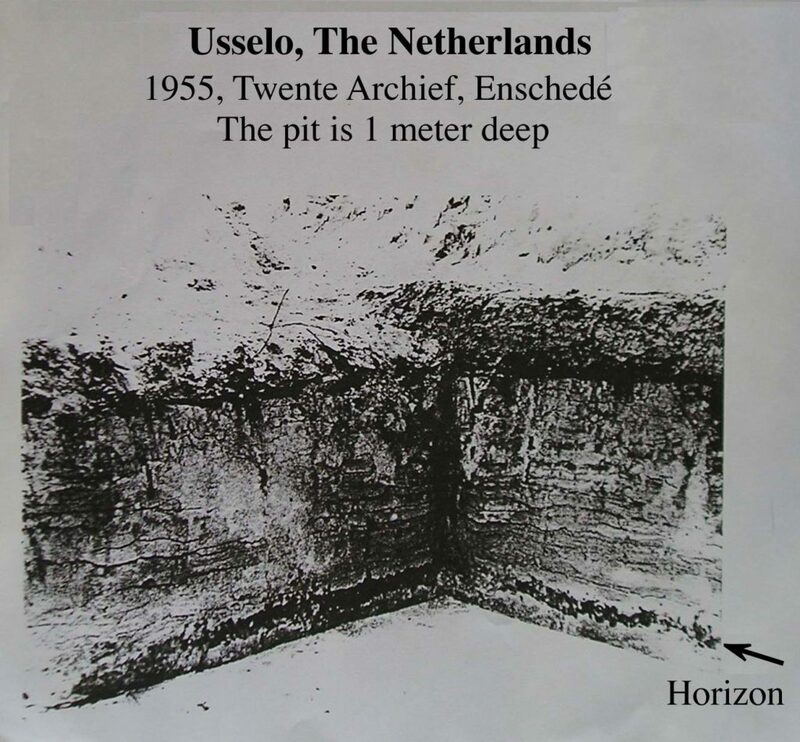 Also these Dutch scientists radiocarbon dated the Usello Horizon to 10.87 kyrs C-14 BP, which converts to 12,854±15 calendar years BP in the Cariaco chronology. This correlates with the time of the concentration peak of biomass burning indicators ammonium, formate, and oxylate, which are found in the GISP2 ice core at a similar date. These indicators immediately precede and follow the 12,837 years BP solar event suggesting that the biomass burning was due to the extreme heat of the solar conflagration rather from a comet impact for which good evidence is lacking. As they pointed out, there is no way that this burning could be due to an impact since the burning took place 70 years after the entry of the Pt rich dust. Their finding supports my prediction that cosmic dust had entered the solar system and triggered elevated solar activity. Since cosmic ray bombardment of the Earth’s atmosphere causes cloud formation and climatic cooling, this explains why climate progressively cooled. It was not due to a low activity period of the Sun as Robert Schoch suggests in his book. In this active state the Sun underwent a sequence of super SPEs which progressively raised radiocarbon concentrations. In 12,837 years BP the Sun underwent its major outburst and pushed away a lot of cosmic dust which caused its cosmic ray activity to subside and the Earth to cease its cooling trend. Then about two hundred years later the Sun underwent another major SPE outburst almost as powerful as the 12,837 years BP event, which drove more dust out of the solar system. Then, for the final two thirds of the YD, climate began to gradually warm. The YD was finally ended by two large SPE’s, one of which was as large as the 12,837 years BP event; see my 2011 paper. These last two events, which match Plato’s date for the sinking of Atlantis (wasting of the ice sheet) produced a major global warming that abruptly ended the ice age and triggered glacier wave flooding. Interesting stuff. Something I read in the above reminded me of a dream that my spouse had about a year or so ago. We were watching news on the t.v., and the news said that Star Betelgeuse went super nova. Also there were other events. Norway’s economy suddenly and surprisingly (to most) tanked. And there was something about unusual hills forming in China. I found the part about the Star Betelgeuse going supernova particularly interesting, as a number of years ago, I read a very interesting NDE account by one Lou Famoso. At some point, Lou was shown, by Archangel Michael I believe, the probable future and various destructive events such as major solar outbursts. After showing him all this, he was told look to Orion to know when these will take place. The Star Betelgeuse of course is part of Orion, and we do know that it’s very unstable from our time perspective. Up until now, I thought that maybe Betelgeuse going supernova might just be a harbinger type event, but if I’m reading the article above correctly, then it could possibly be a trigger/instigator for our Sun to become temporarily hyper active? Betelgeuse is too far away to be a danger to us. If it were to explode it would first need to change into a blue supergiant. Red supergiants don’t explode. Astrophysicists with their standard outmoded theories might believe it is possible for a red supergiant to go into a supernova. But the truth is, at present it won’t.